Performs search of local files with smart queries as with Google. Allows replace simple or multiline text in multiple files. With batch replace operation you can easily replace or update hundreds of different links in several files. Saves results in XML and other formats. 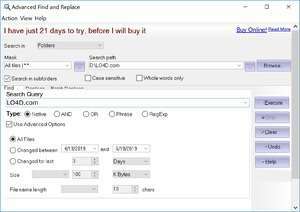 Advanced Find and Replace 8.0 is a shareware program and can be used as a demo to try the software until the free trial period has ended. A full version of the program is available after the trial period ends. For security reasons, you should also check out the Advanced Find and Replace download at LO4D.com which includes virus and malware tests. Additional screenshots of this application download may be available, too.